How to fast convert HD video to SD with Xilisoft HD Video Converter? 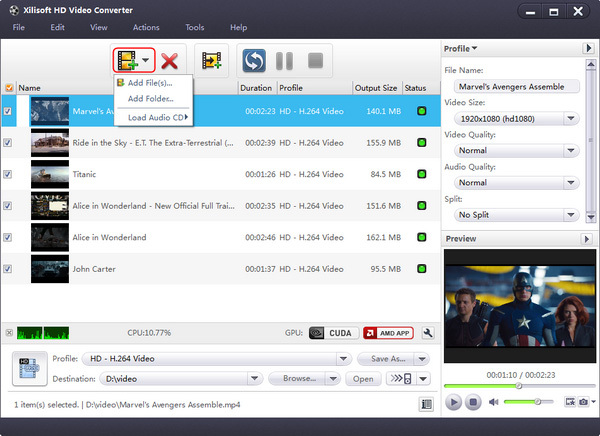 Current Page: Xilisoft > HD Video Converter > How to fast convert HD video to SD? With concise and easy-to-use interface, Xilisoft HD Video Converter can help you convert among HD video formats, convert HD video to SD (Standard-Definition) videos in batches at fast speed! The belowed tips will tell you how to step by step convert HD video to SD with the powerful HD video converter software. 1. 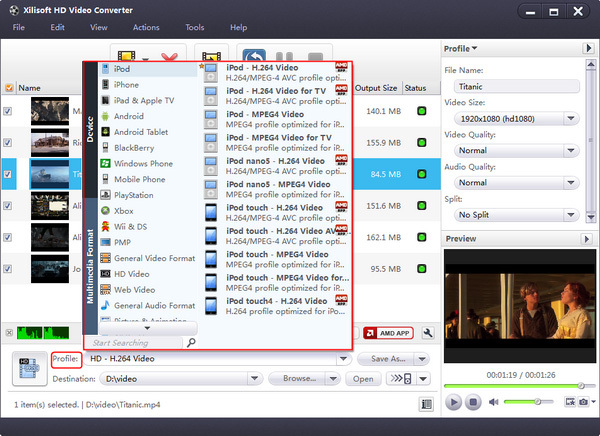 Free download the powerful and easy-to-use Xilisoft HD Video Converter, install and launch. 2. Add the HD files from the "File" menu in batches or add folder. 3. Choose the proper output destination and the target video format. 4. Click "Convert" button! After a few minutes waiting, you can find playing the converted any video files on your any portable music devices like PSP , iPhone is a piece of cake. Tips 1: With auto detection of multi-core CPU, you can append many tasks at one time and the HD video converter will convert them one by one for saving your time. Tips 2: Xilisoft HD Video Converter software provides various HD formats including AVCHD (mts, m2ts), MKV, HD ASF, HD AVI, H.264/AVC, HD Quick Time, HD MPEG-4, and HD WMV for you to choose. Also, you can make more detailed settings such as Bitrate, Sample rate, Zoom, etc. for every profile. Tips 3: As powerful HD converter software, it can capture pictures from videos by setting duration and capture interval, and save them as JPG, GIF, BMP, PNG files. Easy-to-handle interface and super high HD conversion speed will make the whole HD movie to SD video conversion much easier and faster. How to convert Blu-ray to HD with Xilisoft Blu Ray Converter?